Home > Android Reviews > Android vs iOS – Which is more stable ? Android vs iOS – Which is more stable ? Well, then you would assume that data gathered from Crittercism — a research startup that analyzes mobile app crashes — would show that iOS suffers from fewer, if any, app crashes when compared to Android. Right? Wrong. 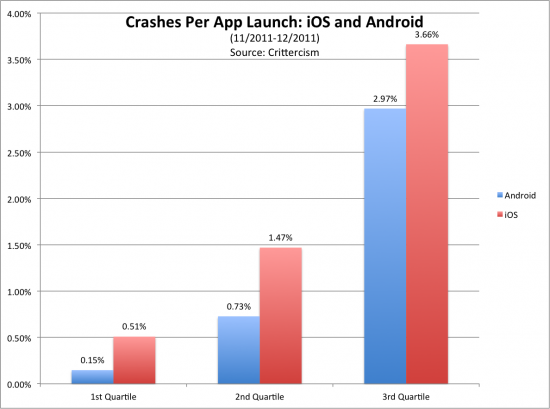 Surprisingly, Crittercism’s data (gathered from more than 214 million app launches between November and December of 2011) shows that apps on iOS crashed much more frequently than comparable apps on Android. Just take a look at that pie graph. 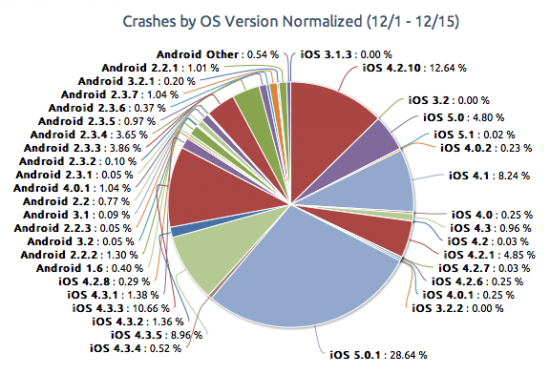 It’s easily dominated by iOS, covering nearly 75% of total crashes. Yup. I was just as blown away as you. Numbers don’t lie. So, if your an iOS user and still want to argue which is more stable. Feel free to comment.